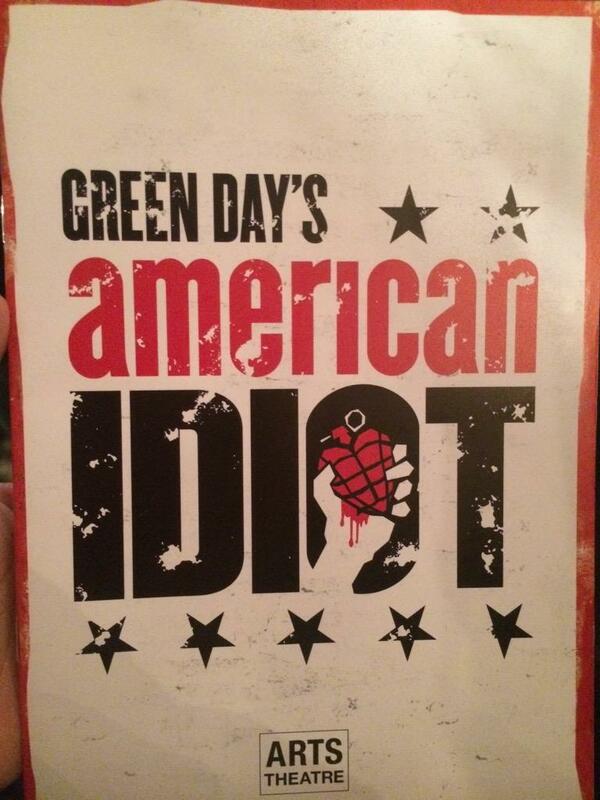 The Green Day musical American Idiot has just kicked off it’s limited run at the Arts Theatre in London, starring XFactor finalist Amelia Lily and theatre star Aaron Sidwell. Produced by David Hutchinson and Phillip Rowntree for Sell a Door Theatre Company, it tells the story of three friends each trying to discover their purposes in life after 9/11. Set in Jingletown USA, it follows three young men named Johnny, Will and Tunny. After the tragic events of 9/11, they are trying to find a meaning and a purpose for their lives. Johnny and Tunny decide to flee to a suburban town whilst Will stays behind to look after his pregnant girlfriend. It show’s their struggles and the choices that they make in their lives which can lead to unfortunate events. The show is 90% told through song and has very little dialogue so my advice if you are going to see the show, would be to heavily research the storyline/the Green day album the show is based on so that it doesn’t get confusing for you. This was a disadvantage for me, maybe because I hadn’t done enough research or I didn’t know all of the songs but my personal opinion is that even if you haven’t done that, the songs should be able to tell the story anyway and at times I did get a little confused. Obviously this is a script writing thing and nothing against this production as they are reviving the show but just a comment I think should be mentioned. The set design was pretty basic but giving that it was a very small theatre, I think that the set worked well for the show and the transitions between scenes/moving items around were done very well. The chemistry between the actors on stage was very believable and I do feel that each person got heavily into the role, especially as the show progressed. It’s actually really refreshing to see a younger cast who clearly are very passionate and that really came across. I can not fault their talent as they were all very energetic with incredible vocals. Also, it was great to see Amelia Lily away from the XFactor chaos and showcase her performance skills as she has a great stage presence. One thing I did really like about the show was the fact that the band were on stage the whole time. Usually when you go to a West End show, the band/orchestra are hidden under the stage and it really did add to the show to have them on stage but not to prominent that it took anything away from what was going on, on the stage. I think the sound effects did enhance the performance and the lights were electric which went with the style of the show.